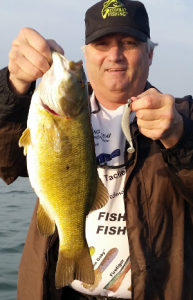 More easy, and exciting bass fishing is yet ahead as we move through the spawning period. The upper bays are starting to play out, yet there will still be opportunities for random spawn beds to develop. You will find random smallmouth cruising around in areas related to structure, and not. 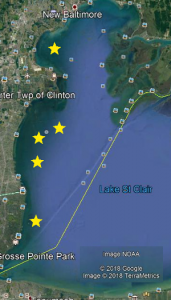 Stable weather at the end of May should bring the entire “main body” spawning period to a close. This would make the 2018 spawning period a fairly typical one. The catch-and-keep fishing regulations were originally set to coincide with the end of the spawn. 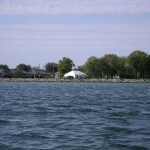 Lake St. Clair opener for bass is on the third Saturday in June. By then, the bulk of spawning activity will be over. As far back as a week ago, the bite pattern changed from a strong crankbait bite to a jerkbait, and soft plastics bite. That is to be expected as the bass bed down. The Xtreme Bass Tackle 4″ Sweet Green tube continues to dominate catch rates in the soft plastics category. Jerkbaits of all colors and sizes are effective. Some colors will be stronger than others. Be ready to engage the post-spawn period, as it will begin without warning. If you are out on a regular basis, you will see the size of the smallmouth drop and catching smaller male smallmouth will become the norm. The larger females will be collecting in schools offshore. Unlike summer schools, these will be harder to track from day-to-day. A drifting presentation in the open will generally be more effective than a, casting to structure presentation, by a factor of 4 to 1. There are some post-spawn smallmouth around from an early spawn that we had at the end of April, early May. You will start to see a handful of these bigger females show up at post-spawn transition points. 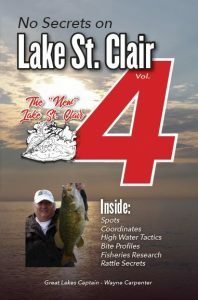 Stay on top of changing conditions with more information in the books, No Secrets on Lake St. Clair volumes #3 and #4. Both of these books were written during the high water period that we are experiencing now. 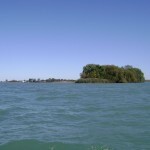 Lake St.Clair has changed a lot as the water levels have risen. 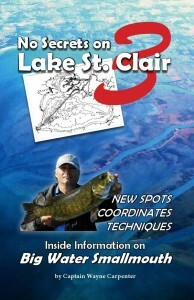 Both of these books give you insights into what the bass are looking for in forage and spot location. You can also find these books and 4″ Sweet Green tubes at 9 Mile and Jefferson Mobile Pit Stop, and Sportsmen’s Direct at Metropolitan Parkway and Jefferson.